Lemontree is a growth company. One of the reasons for our success is our recruitment of talent; Talent that does good things for Lemontree and for our clients. In order to develop our strong company culture further, it is crucial for us to be able to recruit and retain staff who share our values and our desire to make a difference. We prioritise personal qualities, shared values and unpretentious team players over specific compentencies and experience, going from the theory that good people do good things. And good people will do good things at Lemontree. This principle has developed a Lemontree spirit, and is the cornerstone of our slogan: The difference that makes the difference. We offer you the chance to work, and to develop, in a successful young company, with knowledgeable and committed colleagues, clients and partners. Lemontree is an innovative and fast-growing IT company with a focus on customised turnkey solutions within e-management, Enterprise Solutions and Quality Management. Lemontree also supplies qualified consulting services with a focus on strategy and IT. The company’s clients are mainly players in telecomms, the public sector, insurance and finance. A focus on our clients’ competitiveness. 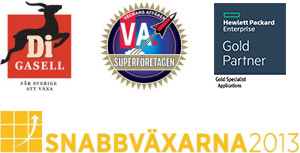 Collaboration with leading product suppliers such as HP Software, Software Innovation, Nordic Edge and Autonomy. The ability to attract top-class employees with specialist expertise in technology and marketing. … and the most important of all: the difference that makes the difference, that little extra something so hard to pinpoint, but which is an integral part of our company culture. The desire and ability to always make that extra effort. At Lemontree, we offer our employees the chance to develop in a successful young company, together with knowledgeable and committed colleagues, clients and partners. We are constantly recruiting, so take a look at our job opportunities or send a spectulative application to recruitment@lemontree.se.